SAL DeTRAGLIA'S VIRTUAL TAPAS BAR: CALÇOTS, TAKE ME AWAAAAAAY! I’d drive halfway across Spain for a good calçotada. In fact, that’s exactly what I did last weekend. 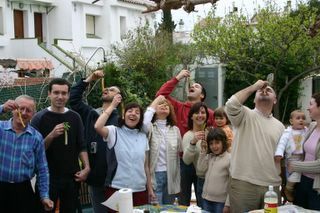 The infamous Marta and her cuddly parents hosted a calçotada at their Tarragonese beach house on Saturday. And it was faaaabulous! What? You’ve never heard of a “calçotada? !” Don’t feel bad. There are plenty of Spaniards who are equally clueless. But that’s why I’m here—to keep my readers well-educated and well-fed. So sit back, grab a glass of something purple, and start taking notes—because Calçots 101 is now in session. A calçotada is, quite simply, a calçot barbeque. It's a phenomenon that takes place mainly in the Cataluña region of Spain’s north-east Mediterranean coast. There are four vital elements to a proper calçotada: a bunch of calçots, a hot grill, a bowl of Romesco Sauce and a bib. …the grill! Calçots should be cooked on a wood or charcoal grill. They are charred until their exteriors are blackened and interiors are tender. After the calçots are removed from the grill, they are wrapped in several layers of newspaper—presumably to steam themselves so that the burnt skins will separate easily from the core. 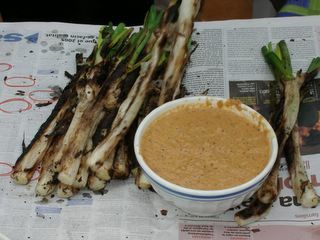 Grilled calçots should be accompanied by a bowl of Romesco Sauce. This is another of Tarragona’s culinary gifts to the world. Romesco Sauce is a thick, coarse, reddish-orange sauce made (more or less) of dried red peppers, garlic, oil, salt, paprika, tomatoes, and bread crumbs or ground nuts. When the calçots are grilled and the sauce prepared, it’s time to eat. This is the fun part—and not just for reasons of taste. Eating calçots requires a special technique that was undoubtedly inspired by frat boys eating goldfish—or vice versa. It’s clumsy, it’s messy and it looks ridiculous—but everybody in Spain does it. Everybody, that is, except my father-in-law. He eats calçots the same way he eats bananas or chicken wings—on Lenox® china with a knife and fork. But back to the technique. With one hand, grab the calçot’s burnt exterior at the bottom. With the other hand, grab a couple of the green stalks at the top—but only the stalks in the center; not those of the perimeter. Then—like a samaurai unsheathing his sword—give it a tug! The calçot’s tender, white core will pull out of its charred, fibrous exterior. Dip the calçot’s core in the Romesco Sauce, tilt your head back, dangle it above your gaping mouth, drop it in and bite. Then remove your shirt and send it to the dry cleaner—unless, that is, you heeded my earlier advice about wearing a bib. And there you have it! A brief primer on calçots, and the glories of calçotadas. As I mentioned, it’s a regional thing. If you want to try some, you’ll have to go to Cataluña. The Catalans consume pretty much all the calçots that they produce—leaving the rest of Spain (and the world) no choice but to survive on Burger King® onion rings. What fun! I want some right now! Do you know if there's a reason the calcots are only grown in Catalan? Is it a climate thing or more of a tradition? Welcome back. Good to hear from you. See...I promised something food-related, and I delivered! "Regarding the "calçots", I know more about how to eat them than about their history, but it seems that "calçots" were "discovered" by a farmer (Xat de Benaiges) from Valls (Tarragona) at the end of XIX century, when he started to grill this type of sweet onion. That is why the tradition of eating "calçots" is originally from Tarragona but it has now extended to many other places in Cataluña. Also the climate for growing the "calçots" has I think some influence, because "calçots" are winter vegetables and you need a humid and mild climate to grow them, with no frost. Most parts of Spain do not offer such conditions during winter time. I do not know if this is of much help !!" To the contrary, it IS of much help. Thanks Julia! Thanks C.Fool! Thanks Tarragona! Now I really want some of these little onions! Not only is this a fun food ritual, it's a celebration of Spring! Now I'm hungry. I love onions and the sauce sounds great. Thanks. But...in the photo, is that the International Guardian? Btw, it sounds delicious and indeed a lot of fun. I suspect that the newpaper is not the International Guardian, since the text is in Spanish. I can confirm, however, that the newspaper was delicious when dipped in Romesco Sauce. Cheers to all my virtual Brazilian friends in Paris! You are more than right commenting your father-in-law extremely good manners. Once in the jungle in the middle of a storm he went out of the cabin wearing a Burberry coat, Sebago mocs and an umbrella. A gentleman. A jungle? An umbrella? A Burberry coat? Sal: You forgot that I need fork and knife for BBQ ribs also.